Spot treatment to remove phosphates (algae food), metals including copper and iron, scaling carbonates, organic debris and other contaminants causing cloudy water. When initially filling pool, pour entire bottle of Revive into the deep end of the pool. Continue filling and as the water level rises, Revive will treat the pool walls and source water resulting in clean, clear water for the initial fill. When filling is complete continue with regular water care program. Note: Use two bottles for heavily contaminated pools. If algae is present, brush walls and shock pool prior to application. Turn off circulation pump and filter. Attach a garden hose to Revive bottle and apply the entire contents over pool surface. Wait 24 to 48 hours for debris to settle to pool bottom then slowly vacuum to waste. Once pool floor is clean restart circulation pump and filter. If water clouds after filtering, clean filter and circulate for 24 hours or until clear and vacuum again. Continue to circulate pump and filter. Attach garden hose to Revive bottle and apply over the pool surface twice. 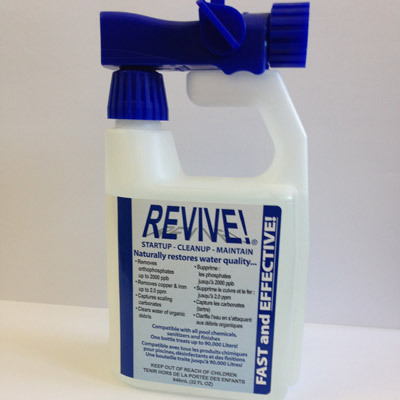 Revive will work in conjunction with pool filter to remove clouding particles and debris. Clean/backwash filter after 7 days.